The Miami Valley Dance Company has been a year-round pre-professional training program and performing ensemble of talented and dedicated young dance students for over 25 years. This non-profit organization welcomes dancers from all over the Miami Valley to audition on a yearly basis. Our dancers perfect their skills with many hours of training with professional choreographers, dancers, and master classes. They present their work at local schools, shopping malls, holiday festivals, and senior citizen centers. 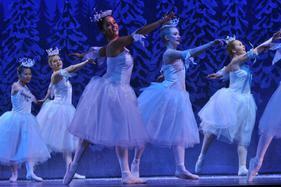 Each year is highlighted with two major productions: The Nutcracker in December and a Spring Gala in March. The Miami Valley Dance Company has toured twice internationally. They have had the privilege of working with some of the best choreographers in the United States and have received more funding through Culture Works than any other pre-professional company in Dayton. The Miami Valley Dance Company rehearses at Terre's Dance Workshop. To contact us call (937)-435-0503 or visit our website terresdanceworkshop.net.